Does your home landscape look as though the plants were air-dropped and rooted where they fell? Do you, like me, practice “couldn’t resist” garden design, stuffing in impulse purchases as fast you bring them home and starting new beds when the old ones overflow? Are you the kind of gardener who has difficulty seeing the garden for the plants? Well, join the sorority, sister. You and I are plant lovers, first and foremost. We thrill at each small blossom on the dodecatheon and won’t rest until we own every new heuchera, no matter how eccentric or consumptive. But, while the resulting random landscape may satisfy our horticultural cravings, on some level we recognize that it could be more than just a repository for remarkable plants: it could have style. 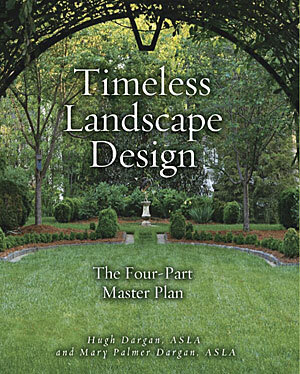 To the rescue comes Timeless Landscape Design: the Four-Part Master Plan, a new book by professional landscape architects Mary Palmer Dargan and her husband Hugh Graham Dargan. The Dargans draw on their 35 years in the profession to sum up the mechanics of landscape design for those of us who dream of creating our own unforgettable outdoor spaces. Is it coincidence that their surname is a virtual anagram of “garden”? I think not. In addition to this step-by-step process, the book offers help for those of us who lack the ability to visualize, including techniques such as sketching design ideas directly onto photographs, and drawing full-scale mock-ups of potential garden furnishings which can be easily (and cheaply) moved about the garden until a decision is reached. The photographs are plentiful and inspiring, if, perhaps, on a rather grand scale; the owner of the average suburban lot will have to stretch their imaginations to shrink the images to fit. But the magnificent properties presented challenge us to aspire to greatness. Timeless Landscape Design is an excellent investment for the do-it-yourselfer who is serious about achieving the sophisticated look of a professionally-designed landscape. Best of all for us plant lovers, the Dargans stay true to their mission of landscape architecture, leaving the plant selection to us. Don’t worry; we’ll take it from here.